When did you last have enough free time to carefully create, develop, and test a therapeutic concept or teaching method to improve the help you provide to your patients? With The Therapist's Notebook, a compilation of original ideas by practicing clinicians, you can tap into the knowledge and experience of seasoned professionals to give your clients tangible, field-tested assignments that will represent their work and progress in therapy. Appropriate for practicing marriage and family therapists, psychologists, social workers, and other therapists of any professional affiliation who deal with children, adolescents, adults, couples, or families, this dynamic handbook provides you with handouts and homework activities that are quick and easy and require little effort or experience to use. The Therapist's Notebook gives you a tangible, useful product you can utilize with clients. 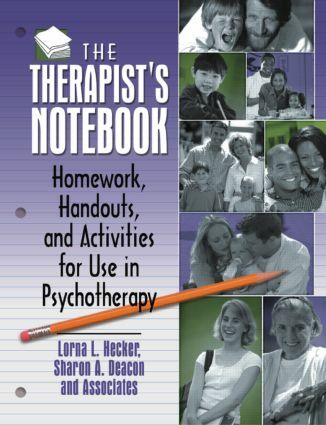 The book's compilation of homework, handouts, and activities that have been successfully applied to client populations is valuable not only for therapists’daily use, but also to illustrate creative, clinically tested interventions to future counselors, therapists, social workers, teachers, school psychologists, and special educators. Particularly useful as an ancillary text in university courses in psychotherapy-related fields, the book's user-friendly format will enliven practicum courses and ensure heightened student participation.